After last week’s Louisville win against UConn, Notre Dame moved up one spot in this week’s rankings to #4 behind Baylor, Louisville and Oregon. The Irish remain at the top of the RPI because the Irish schedule is rated the nation’s toughest. It’s a schedule that isn’t getting easier down the stretch as the Irish will face four ranked teams in the last seven regular season games. ND has a home game this Sunday against #24 Florida State, and upcoming road games against #9 NC State and #15 Syracuse. First, though, the Irish travel to Miami this week to play the #25 Hurricanes Thursday night. Notre Dame has arguably a tougher road ahead than any of the three teams ahead of them and UConn, which sits just behind the Irish in the #5 spot. Louisville plays three ranked ACC opponents — Syracuse, Miami and NC State — but all three are home games. Baylor has two ranked teams left on the schedule — a road game against #22 Iowa State and a home game against #14 Texas. The Longhorns may slip a spot or two after losing to Baylor in Austin earlier this week. Oregon has three ranked foes ahead — a home and home with #7 Oregon State and at #11 Stanford. Meanwhile, UConn only has a home game against #12 South Carolina left on its regular season schedule. Miami, which holds one of only four ACC regular season wins against the Irish since ND joined the conference, is currently 7-2 in the ACC and 19-5 overall. Their two conference losses were at home to Clemson (by 9) and Florida State (by 4) in Tallahassee. Their non-conference losses are to Iowa State (by 13), Purdue (by 11), and Central Michigan (by 10). The Canes do have a number of impressive wins. They beat Marquette, now sitting at #8 in the AP poll, by 8 points at home. They also topped North Carolina (by 8) at home and Syracuse (by 13) on the road. Miami averages 75.4 points a game and makes 45.8% of its field goal attempts. Canes’ shooters average 36.9% beyond the arc, and make an average of 7.4 threes per game. Miami has two impressive players in the post and average 42.8 rebounds per game — an 8.2 advantage over opponents. The Canes average 16.2 assists and 16.6 turnovers a game. They only force 14.7 opponent giveaways. The Canes’ leading scorer is 6’4” junior Beatrice Mompremier, who is playing her first season at Miami after transferring from Baylor to be closer to her Miami home. She averages a double-double — 16.3 points and 11.7 rebounds per game. Mompremier shoots 54.6% from the field, but just 55.3% from the line. Emese Hof, a 6’3” senior from the Netherlands, gives Miami a formidable 1-2 punch under the basket. She averages 13.8 points and 8.4 rebounds, and connects on 61.1% of her shots. She also has 48 of the Canes’ 89 blocks on the season. The other starters are guards — 5’4” sophomore Mykea Gray, who averages 12.7 points and shoots 40.1%, 5’8” junior Laura Cornelius from the Netherlands chips in with 10.2 points per game, and 5’9” sophomore Kelsey Marshall, who averages 9.0 points per game. Cornelius leads the team in assists with 101 vs. 58 turnovers. She also makes just over 88% of her free throw attempts. All three guards are three-point threats. Cornelius has hit 38 (38.4%), Gray 43 (34.1%), and Marshall has made the most — 52 (38.8%). The top reserves appear to be Sarah Mortensen, a 6’1” junior wing from Denmark, who only averages 4.0 points per game. She has made 28 of 61 three-point attempts (45%), and 5’9 sophomore guard Endia Banks, who averages 3.6 points and 3.4 rebounds. Irish Notes: Notre Dame’s three-point shooting has improved in ACC play — from 37.5% and an average of 3.7 made threes per game in the non-conference to 42.1% and 5.3 made threes in the nine ACC games played to date. The improvement is due to Marina Mabrey settling into the season and finding her spots and her teammates finding her. As she proved with her 6 for 7 effort in Sunday’s game against Georgia Tech, Mabrey is deadly when her feet are set and she receives on-target passes. After missing the first five games of the season with a leg injury, Mabrey started slowly. She only made 5 of 19 attempts (26.3%) over the first three games after returning to the lineup. Since then, she’s connected on 45 of 84 (53.6%) overall and 32 of 57 (56.1%) in ACC play. The hot shooting has moved her season percentage to 48.5%. If she can maintain that accuracy, it would be the highest three-point shooting percentage ever by an ND senior. Madison Cable made 47.6% her last year at ND and is the current record holder. Mabrey has made 40.1% of her three-point attempts for her career, so she is no threat to the career three-point average of 47.6% set by Alicia Ratay. That mark is still the best ever in the NCAA. 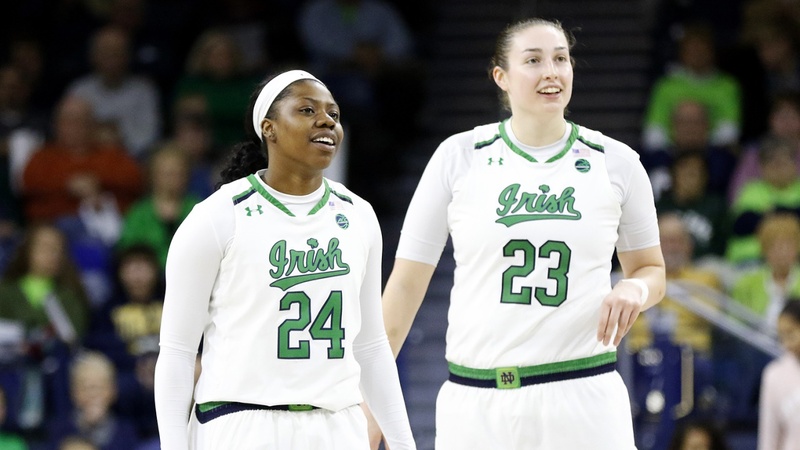 Mabrey is also not likely to threaten Ratay’s single-season best of 54.7%, which she set in helping the Irish win the 2001 National Championship. However, Mabrey is on track to make the most three-point baskets in school history. At the moment, she is averaging 3.6 made threes in ACC play, and she sits just 5 behind Sheila McMillen and 18 behind Ratay in career three-point makes. While Mabrey has improved her three-point shooting as the season has progressed, Arike Ogunbowale’s three-point accuracy has not picked up. She’s only made 12 of 41 attempts in ACC play (29.3%). This is just slightly below her accuracy in the fourteen non-conference games — 19 of 64 (29.7%). Ogunbowale made 38.0% of her 171 three-point tries last season and 45.4% of 141 attempts her sophomore year. Mabrey and Ogunbowale have combined for 76% of ND’s three-point attempts this season. Jackie Young has made 6 of her 17 three-point attempts (35.3%) — however, she’s only attempted three since the start of ACC play. Jordan Nixon is 5 for 14 (35.7%), Abby Prohaska is 0 for 3, Katlyn Gilbert was 1 for 5 before her injury, and Jessica Shepard actually tried one and missed early in the season against Oregon State and hasn’t attempted another since. Danielle Cosgrove has attempted 23 three-point shots in mop-up time. She’s made 7 (30.4%). While some ND opponents, like DePaul and Syracuse, make the three-point shot a major part of their offense, the Irish have never relied on taking and making a lot of threes. While the current average of made three-point shots is up to 5.3 on 12.7 attempts in the ACC, it stands at 4.3 for the whole season on 11.9 attempts per game. That average is in line with made three-pointers over the past eight seasons, which range from a low of 3.6 in 2010-11 to a high of 5.9 in the two recent seasons that ND missed the final four. Both Ogunbowale and Marina Mabrey were on those teams as freshmen and sophomores. Madison Cable and Michaela Mabrey combined for 315 attempts on the 2015-16 team. Lindsay Allen and Mychal Johnson also shot a number of threes that season as the Irish attempted an average of 14.4 three-pointers per game. Two seasons ago, Erin Boley joined the younger Mabrey and Ogunbowale in each taking over 100 attempts. Allen, Johnson, Young and Kat Westbeld combined for another 92 attempts as the team averaged 14.8 attempts per game. The last three seasons in the Big East and the first two in the ACC, Notre Dame averaged between 9.9 and 12.9 three-point attempts per game. Over that same period, opponents averaged between 13.4 and 16.9 attempts. Opponents three-point tries have picked up steadily over the last four seasons — 17.8 in 2015-16, 19.1 in 16-17, 20.4 last season and 21.6 this season. However, opponents are only connecting on 26.8% of their tries this season for an average of 5.8 makes per game. That’s the lowest shooting percentage beyond the arc in the last seven seasons against the Irish. Only seven teams made more three-point baskets than their average per game at the time the game was played and five of those teams lost to the Irish by an average of 46 points. Only North Carolina, which connected on 11 of 27 (40.7%), was able to use long-range shooting effectively to defeat the Irish. The Tar Heels had averaged 8.3 made threes and 33.3% before the game vs. the Irish. UNC is one of nine Irish opponents that are currently in the top 50 in the NCAA in made three-pointers per game — from Boston College at 8.1 to DePaul at 11.7. UNC’s average is up to 8.5 makes per game. Only Syracuse and the rematch with BC are left to be played in the regular season.